Republic of Yoga’s newly created advanced yoga teacher training program provides the tools to enable experienced yoga teachers to become master teachers of yoga. Possessed of a wealth of knowledge, wisdom and understanding of the history and philosophy of yoga, a thorough understanding of human anatomy and physiology, as well as practical experience in teaching a wide range of yoga styles, meditation and pranayama practices, graduates will be equipped to successfully teach in nearly any setting. Our 300-Hour Yoga Alliance registered program builds upon our 200-Hour Teacher Training program’s foundations of traditional Hatha Yoga techniques and ancient philosophy in conjunction with Tibetan Buddhist principles. This course offers an in-depth study of Classical Hatha Yoga according to the teachings of Swami Sivananda; with teachings from the ancient lineages of yoga philosophy based on the Vedas, Upanishads, and especially the Bhagavad Gita and Yoga Sutras of Patanjali. 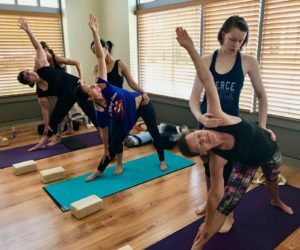 The program features advanced study of yoga anatomy and physiology; yoga practices that include power vinyasa, yin yoga, restorative yoga, adaptive yoga for those with limited mobility, meditation, pranayama and chanting. This unique, immersive learning experience has been largely written and developed by John Grey, and is co-taught by Nicole Nichols, Republic of Yoga founder & Director and husband and wife team John Grey and Julie Sennema, owners of Living Yoga LLC. Please note that this will be a physically, intellectually, and spiritually demanding advanced yoga teacher training program, and is designed for any experienced yoga teacher committed to learn, embody, and gratefully pass on the teachings of yoga as a way of life. 2020 Dates: January 10-12, February 21-23, March 20-22, April 24-26, May 15-17. Final Exam and Graduation Day is May 17. *November 15-17: Friday’s session will begin at 9:00 a.m. on November 15. $4700.00 with deposit and payment arrangements made by Feb. 28, 2019. $4850.00 with deposit and payment arrangements made by March 31, 2019. Add 3% for payments made with credit card. Installment Plans Available – Up to 9 payments beginning no later than April 15, 2019, which may be customized to fit your needs (prices shown above, plus $100 processing fee). Tuition includes 20 prepaid classes (a $280 value), to be taken over the course of the program. Additional classes may be purchased at a discounted rate. A $500 non-refundable and non-transferable deposit is due upon acceptance of your application to secure your spot and will be applied to the program cost. Sunday, February 17, 3:30-4:30pm. Register. Saturday, March 23, 1:30-2:30pm. Register. Sunday, April 7, 1:30-2:30pm. Register. Saturday, May 4, 1:00-2:00pm. Register.